Fielding’s Oil and Propane is a trusted, family-owned, Maine company that services customers all over Southern and Central Maine as well as the Rochester and Portsmouth, New Hampshire areas. The company owned by Bill and Dave Fielding, who bought it from their parents 20 years ago, is one of the top names in fuel. Whether it’s gasoline, heating or air conditioning service, Fielding’s can help most everyone. The company runs 30 oil trucks, seven propane trucks, four transports that deliver wholesale fuel and 14 burner service technicians. It also has 20 customer service representatives for a total of 75 employees. They work with residential, commercial and industrial clients. Fielding’s Oil has been delivering to the Windham area for 34 years. They deliver as far north as Bangor and as far south as Newington, New Hampshire, the Hamptons and all towns in between. Between residential and commercial accounts, they have approximately 40,000 customers. “Our name’s been around, so they know us. We’ve been around for 50 years,” Bill Fielding said, who started working as a teenager and was groomed into the business. Not everyone is primed for this business, it seems. “Finding truck drivers and employees is hard. No one wants to work hard,” Bill said. There are some strict regulations on drivers, and they are in demand. But despite the fact that it is difficult to find the right people, Fielding states he is proud of those who do work for the company. “Good people work within our company,” he added. 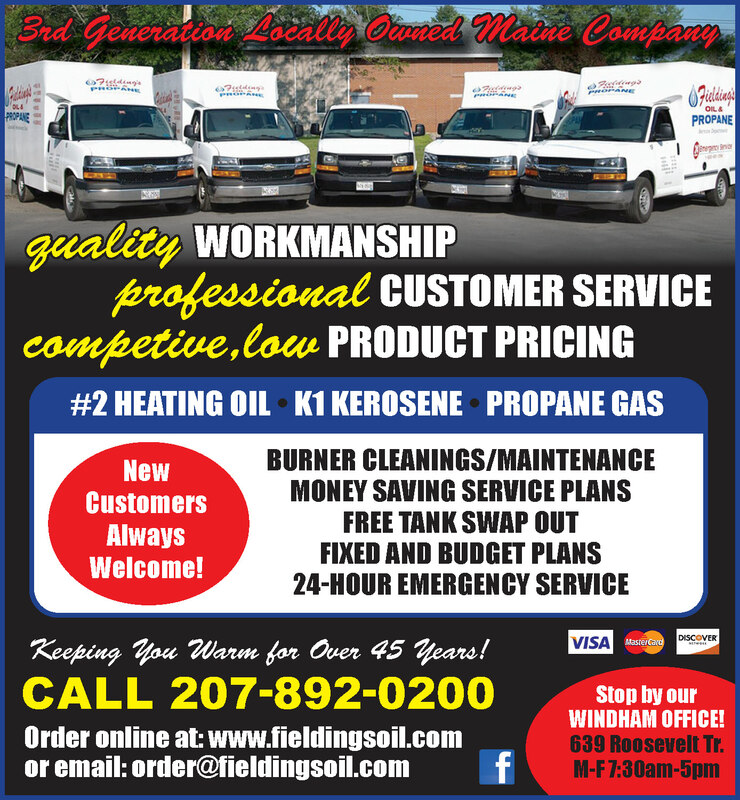 Taking care of customers heating needs all over Maine and into New Hampshire has been challenging, but the team at Fielding’s Oil makes it seem easy. “We kept up even when it was 20 below,” said Bill. 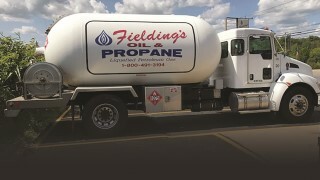 The recent cold weather struck all oil companies hard, but Fielding’s continued to deliver to all its accounts. Fielding’s Oil and Propane has a payment plan for any budget. It works with pre-buys, budget plans, cap program, fixed program, automatic delivery, will call and 30-day and 15-day credit plans. Checks, cash and major credit cards are accepted. The best part of owning an energy company is “the freedom of having your own business,” said Bill. Fielding’s Oil delivers to wholesale fuel accounts, to small businesses like landscapers, excavators, farmers and gas stations. It also works with local contractors to help with new construction installations of propane, oil, diesel fuel and K-1 Kerosene heat sources. “We do cleaning and everything to do with service,” Bill said. He prides his company on the customer service and ability to meet the needs of every type of customer. The importance of having yearly maintenance is vital and Fielding’s Oil and Propane can keep your equipment running smoothly and competently. The combustion process of burning fuel to produce heat must be precise to maintain efficiency and safety. Even a small problem can lead to gas leaking into your home or dangerous carbon monoxide levels. Fielding’s technicians will do a full check to not only clean but also inspect all parts to catch small problems before they turn into major repairs or safety issues. It is shown that seventy five percent of no-heat calls in the winter are related to lack of maintenance. Not maintaining your furnace can cause it to run less efficiently, making it work harder and therefore increasing your monthly energy bills. Even if your furnace is new, it still requires inspection as various factors can cause rust and dirt to accumulate. It also keeps your warranty valid. Having maintenance done in the spring is a great idea since you have spent an entire season running it. Fielding’s Oil and Propane can check for any damage that may have occurred and then if repairs are needed you can come up with a plan and save for any work that does need to be done before the next snowflakes start falling. For more information or to place an order, call 892-0200 or 1-800-491-3194, visit them on the internet at www.fieldingsoil.com or stop by one of the four offices: Scarborough, Auburn, Augusta and Newington, NH. They are currently accepting new customers. All offices are open from 7:30 a.m. to 5:00 p.m. Monday through Friday. 8:00 a.m. to 12:30 p.m. on Saturdays during the winter months. There is a 24-hour emergency delivery and service line with technicians always on call.